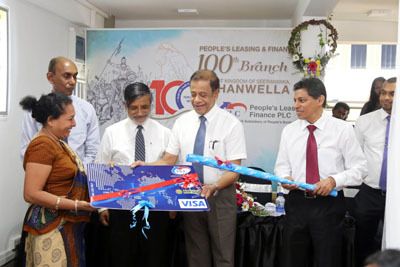 People’s Leasing & Finance (PLC) opened its centennial branch in Hanwella town at 132/3, Colombo Road, Hanwella, recently. The new branch was declared open by Hemasiri Fernando, Chairman, PLC, on the invitation of D. P. Kumarage, CEO/General Manager. PLC’s maiden branch was commissioned in 1996 within the premises of People’s Bank, Kandy. The occasion of the centenary branch opening in Hanwella was also graced by Sabri Ibrahim, CEO Designate, senior management of PLC, special guests and customers. People’s Leasing was incorporated in 1995 as a wholly owned subsidiary of the largest state bank in Sri Lanka, People’s Bank.